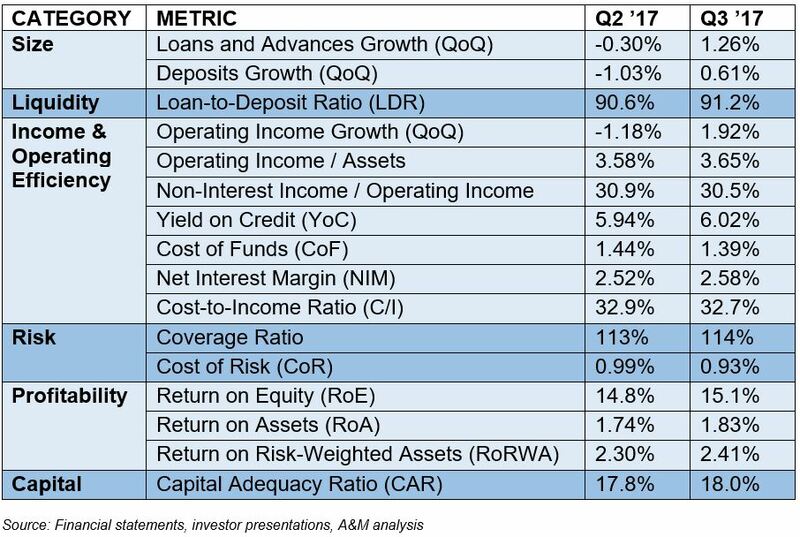 Driven by growth in lending activity that generated higher levels of interest income, costs remain stable and profitability and returns on equity increase. Dubai – Leading global professional services firm Alvarez & Marsal (A&M) today released its fourth UAE Banking Pulse report, which shows that UAE banks are generally performing well, with overall higher profitability. The underlying theme is a rise in profitability, on the back of an increase in loans and advances, and a rise in yield on credit. The result was higher levels of interest income and, with costs remaining steady and a lower cost of funding, banks saw higher returns on equity. This UAE Banking Pulse report compares the quarterly data of the 10 largest listed UAE banks in the third quarter of 2017 (Q3 2017) against the second quarter of 2017 (Q2 2017), and identifies prevailing trends throughout the intervening period. The report uses independently-sourced published market data and 16 different metrics to assess the key performance areas including size, liquidity, income, operating efficiency, risk, profitability and capital. Almost all of the metrics applied by the UAE Banking Pulse report have risen quarter on quarter, suggesting that banks have successfully adapted to the market conditions created by a lower oil price environment, have grown their loan books and are continuing to manage their costs sensibly. The banks analysed in A&M’s UAE Banking Pulse include First Abu Dhabi Bank (FAB), Emirates NBD (ENBD), Abu Dhabi Commercial Bank (ADCB), Dubai Islamic Bank (DIB), Mashreq Bank (Mashreq), Abu Dhabi Islamic Bank (ADIB), Union National Bank (UNB), Commercial Bank of Dubai (CBD), National Bank of Ras Al-Khaimah (RAK) and the National Bank of Fujairah (NBF). The table below (which is explained on page four of the UAE Banking Pulse report) sets out the key metrics applied, with some of the major trends identified. 1. Loans and advances (L&A) for the top 10 banks grew at a faster rate (1.26 percent) than deposits (0.6 percent), meaning that eight of the top 10 banks increased their Loan-to-Deposit ratios. 2. Operating income growth increased on the back of a rise in interest income following increased lending activity; all 10 banks reported growth in interest income. 5. The overall cost of risk declined, driven by lower provisioning and increased loan portfolios, although four banks increased their cost of risk. 6. RoE increased due to higher levels of interest income and increased income margins and leverage. Dr. Saeeda Jaffar, Co-head of A&M’s Middle East office and a Managing Director with the firm’s Performance Improvement and Financial Institutions Advisory Services Practices, served as lead author. Managing Directors Asad Ahmed and Neil Hayward, Co-heads of the Middle East office who specializes in turnaround and restructuring, served as a co-authors. To access the report from Q1 2017, click here. To access the report from Q2 2017, click here.